Chicagoland boutiques will "battle" on Sunday, April 14th, to be crowned The Best Boutique of 2013. 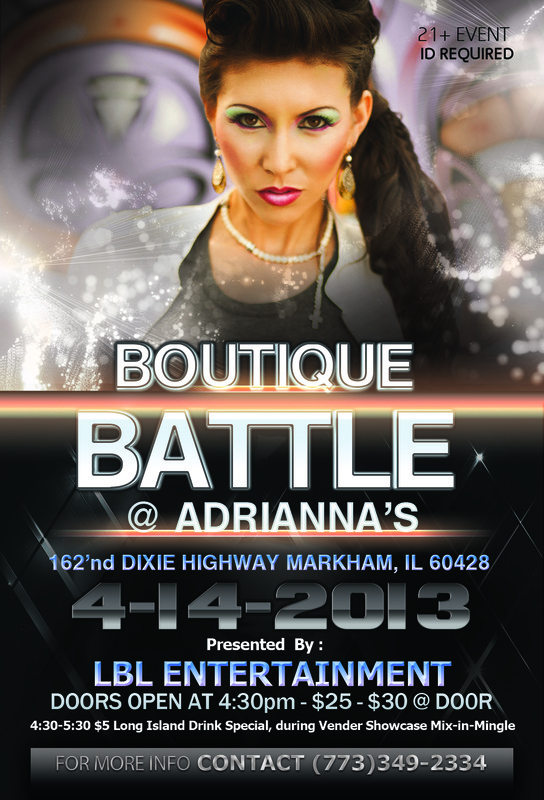 The Battle will be held on the catwalk at Adrianna's in Markham, IL. The networking and vendor showcasing starts at 4:30 and the actual battle begins at 6 p.m. This event will ultimately showcase and provide exposure to small businesses in the Chicagoland area. Eight to ten boutiques, along with 2-3 local artists and 12-15 vendors will all be a part of this fashion forward event. This event allows boutiques a chance to let the audience and judges know who they are, what type of boutique they are and even where they are located, while being involved in a friendly competition. opportunity to mingle and shop at the vendor booths, while networking.